The "Kawagoe Jôshi" scenes is the third scene of the 1st act of "Yoshitsune Senbon Zakura". 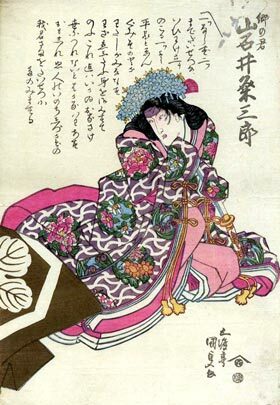 It is staged on rare occasions, as the opening scene of a tôshi kyôgen production of "Yoshitsune Senbon Zakura". Kyô-no-Kimi, Yoshitsune's wife, has been ailing, and to entertain her a musical party has been arranged. Two of Yoshitsune's most devoted retainers, Kataoka Hachirô and Ise no Saburô, arrive late. They explain that they are troubled because Benkei, the warrior-priest who was one of Yoshitsune's earliest adherents, is in disgrace. He accompanied their lord to the Imperial Court and insisted on wearing full war-harness. Some of the courtiers laughed at him, since now there is peace everywhere, and there has been a quarrel. Kataoka Hachirô and Ise no Saburô appeal to Kyô-no-Kimi to intercede with Yoshitsune on Benkei's behalf. Shizuka Gozen, who is a dancing girl of great skill, comes to perform before Kyô-no-Kimi. After she has danced, she also appeals to Kyô-no-Kimi to help Benkei. Kyô-no-Kimi suggests that they all go to Yoshitsune together. Benkei is summoned and appears, still armed to the teeth. Another of Yoshitsune's retainers, Shinohara Tônai, arrives with disturbing news. He has heard that a party of samurai from Kamakura, the headquarters of Yoshitsune's brother Yoritomo, has arrived in Kyôto ostensibly to visit the shrines, but in reality to attack Yoshitsune. They are led by Unno no Tarô Yukinaga. At this moment, another Kamakura lord has presented himself at the palace and wished to speak to Yoshitsune. He is Kawagoe Tarô Shigeyori. Kyô-no-Kimi directs that he must be admitted, adding that, since he is related to her, there is nothing to fear. She and Shizuka Gozen go out accompanied by Benkei, who is delighted at the prospect of a good fight. Yoshitsune and Kawagoe enter in formal dress. After courtesies have been exchanged, Kawagoe announces that he comes as Yoritomo's ambassador. As such, Yoshitsune yields him the place of honour. Kawagoe has three questions to ask Yoshitsune. The first is: does Yoshitsune bear resentment because Yoritomo refused to receive him when he came to Kamakura? Yoshitsune replies that as a younger brother he has no right to question or resent the decisions of his senior. The second question is: why did Yoshitsune send to Kamakura three false heads purporting to be those of the Taira princes, Tomomori, Koremori and Noritsune? Yoshitsune replies that no one knows the fate of these men, although they are thought to have thrown themselves into the sea. Although the country is now at peace, there is still a strong Taira faction. If it were rumoured that these princes still lived, this faction would be greatly strengthened. Therefore he sent the false heads so that it should be generally believed that they were killed in the battle. Then, says Kawagoe, it is not true that Yoshitsune is plotting treason? It is said in Kamakura that Yoshitsune has received from the ex-Emperor Goshirakawa the gift of a precious drum as a pledge of support, should Yoshitsune attempt to overthrow Yoritomo. 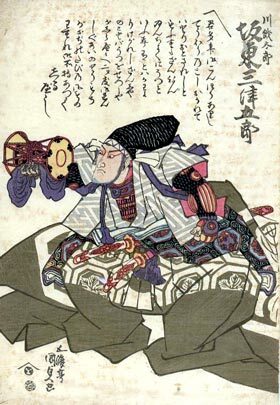 At this Yoshitsune becomes angry and hotly denies the charge, saying that the drum was a gift of friendship and, in any case, he himself has never made use of it. The third question is: Why has Yoshitsune married Kyô-no-Kimi, the daughter of Taira Tokitada? Yoshitsune replies asking whether Yoritomo has not taken a wife from the house of Hôjô, vassals of the Taira? In any case, he adds, Kawagoe is the last person who should ask him such a question, since Kawagoe knows that Kyô-no-Kimi is his own daughter and only adopted by the Taira. Is Kawagoe afraid that if he acknowledges Yoshitsune as his son-in-law, he will lose Yoritomo's favour? Kawagoe admits the truth of Yoshitsune's accusation, and, deeply shamed, wishes to commit suicide. But Kyô-no-Kimi rushes into the room in time to prevent him. She seizes his sword and stabs herself, saying that, if she is the cause of this quarrel between brothers, she will put an end to it. Kawagoe praises her for her courage and devotion while Yoshitsune mourns bitterly. Kyô-no-Kimi promises him that they will be happier in another life; then telling her father to carry "this Taira head" to Kamakura to appease Yoritomo, she dies. There are sounds of fighting outside. Yoshitsune guesses that Unno no Tarô Yukinaga must be attacking the palace with his force. He is about to join his followers when Kawagoe begs him to do all he can to prevent bloodshed, lest it make a permanent breach between him and Yoritomo. Yoshitsune calls to Benkei to give him this order, but is told that Benkei has already gone to engage the enemy. Yoshitsune sends Shizuka Gozen after him, but almost immediately Kataoka Hachirô and Ise no Saburô return to announce that Benkei has killed Unno no Tarô Yukinaga. Kawagoe remarks sadly that now Kyô-no-Kimi has died in vain. Yoshitsune tells him that, since he does not intend to fight against his brother, he will leave Kyôto secretly with only a small following. Kawagoe takes the precious drum from the alcove and gives it to Yoshitsune, bidding him take it to bring him good fortune.